A well composed image, Debapratim. The red tones in the background play beautifully with the red blossoms. Beautiful detail and sharpness! Well done! Last edited by Ron Day on Wed Nov 14, 2018 5:27 pm, edited 3 times in total. Super shot! Love the color, comp and nice clean background. well said. an enjoyable and easy on the eye image. You have shown us some wonderful images of this fascinating species, Debapratim and this is another fine shot. Exquisite detail and lovely colour with the coral flowers, although it can't be comfortable on that prickly branch! Beautiful image. 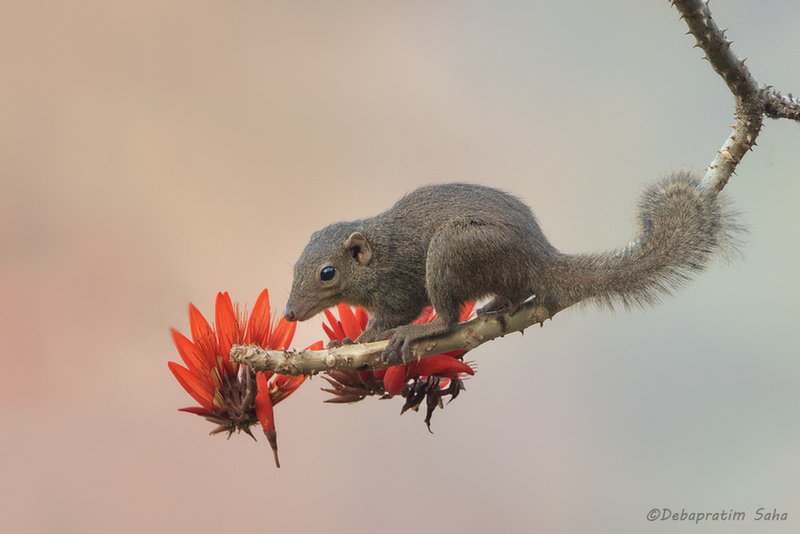 Terrific shot- love the red blossoms offsetting this interesting creature. The background is a perfect match. Excellent! I have never seen one of these cute critters. the red flowers are a nice touch, giving a good bit of contrast. This is so nice. I love the composition with the branch anchoring n the upper corner and the nice curved line coming through to the shrew and the red flowers. A delightful image. Working on a personal website.... Comments and advice welcome.